RBTH presents a selection of views from leading Russian media, featuring cautious optimism for a military de-escalation in Ukraine’s east, analysis of the effectiveness of Kiev’s military campaign, and news of a $48 million pledge from the U.S. to tighten Ukraine’s borders. The newspaper Kommersant has published an article featuring Ukrainian President Petro Poroshenko’s recent statement that he intends to bring an end to the violence in Eastern Ukraine this week. 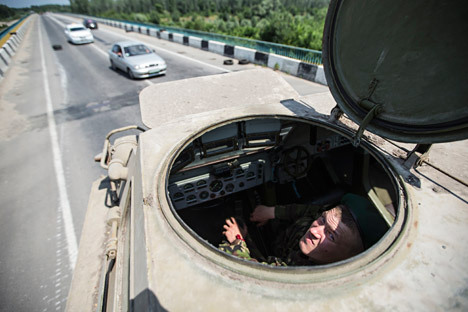 The publication notes that for the first time Kiev has set deadlines for ending the military confrontation in the Donbass, stating that a situation “in which people are dying everyday, in which Ukraine is paying such a high price,” is unacceptable. Expert emphasizes that Kiev’s “anti-terrorist” operation has failed miserably. It has failed from a military perspective; the Ukrainian army’s victory in the battle for the airport in Donetsk and the occupation of Krasnyi Lyman are the only parts of the operation that can be considered to have been more or less successful. From an economic perspective, the operation has become a severe burden on the Ukrainian government. The publication mentions that the government spends millions of dollars on the operation on a daily basis, and the country is living on the expectation of new credits from the IMF and other international institutions. However, the problem is that if Poroshenko, who “has literally just taken office as president and is not formally responsible for the war crimes of the coup,” could afford to stop the operation, not everybody in Kiev would agree with him. Nezavisimaya Gazeta is also reporting on the start of Ukrainian-Russian negotiations regarding the stabilization of Eastern Ukraine. Petro Poroshenko, who was present during the negotiations, called on the contact group to do everything possible to stop the armed conflict in the East before the end of the week. The publication notes that he wants the first step to be tighter border controls, reminding its readers that this recommendation was first given by the Pentagon delegation that was in Kiev last week. The United States intends to allocate an additional $48 million to Ukraine in order to help ensure border security. According to Nezavisimaya Gazeta’s information, the U.S. is prepared to provide aid to Kiev in other areas as well: “A group of American military advisors will soon travel to Ukraine in order to evaluate medium and long-term needs in terms of military reforms.” The initiative would include training Ukrainian soldiers, conducting joint training sessions, and providing military and technical assistance. NATO, according to the publication, also plans to expand the scope of its partnership with Ukraine in the near future. According to the publication, the organization plans to provide assistance in defense sector reforms, as well as in the development and modernization of the Ukrainian armed forces. Nezavisimaya notes that during Viktor Yanukovych’s presidency, Ukraine declared a non-aligned status, and the new government does not intend to abandon that position at this time. The article states that Petro Poroshenko has initiated the signing of a new international document that guarantees the territorial integrity and security of Ukraine, but has not, according to Nezavisimaya, breached the topic of NATO membership.